Historic Shed is pleased to be participating in the $16,000 ULTIMATE BACKYARD MAKEOVER. The contest is hosted by Backyard Getaway and sponsored by WQ|Magazine. 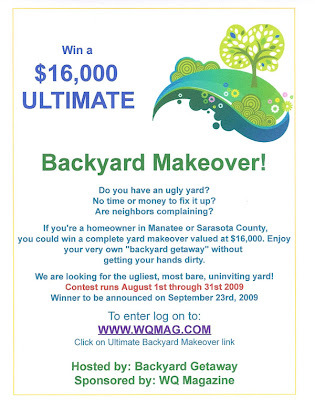 The contest is open to homeowners in Sarasota and Manatee Counties. Entries may be submitted starting August 1st and the Top Ten Finalists will be announced August 24th, 2009. The finalists will be voted on during August 24 – September 18th and the winner will be announced on September 23rd, 2009. For more information go to whatabackyard.com. The contest winner will receive a backyard makeover up to 1200 s.f. with a water feature, butterfly garden, exterior lighting, and, of course, a perfect garden shed. We are so glad to have Historic Sheds in this project. A backyard isn't complete without a shed. Why shouldn't it be a beautiful one!